Thanks for your PR #1274. I'm going to review it next. It would be great if you could review this. Then, maybe @westonruter could give it another look and merge when it's ready. The admin pointer should appear on checking out this branch and loading /wp-admin. Mainly follows Weston's mockup in Issue 1254. Enqueues the script only if this pointer hasn't been dismissed. Mainly follow Weston's mockup in Issue 1254. Enqueue the script only if this hasn't been dismissed. Also uses the scaffold of amp-block-validation.js. When you're testing this, you might have to change this value locally. Once you dismiss the pointer, it won't display again. Unless you manually update the user meta value. This bootstrapping is repetitive. 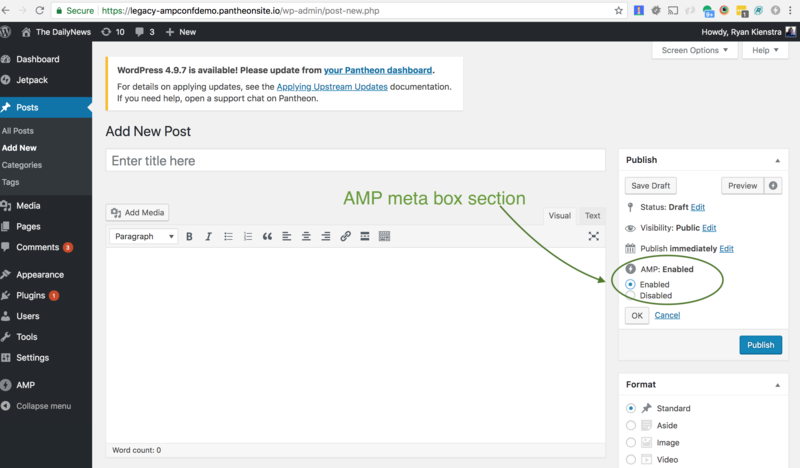 It'd be nice if amp_post_meta_box(), amp_editor_core_blocks(), and amp_admin_pointer() could be combined into one function, like amp_admin_bootstrap(). But in the unlikely case that a user unhooked one of these from wp_loaded, this would break that. Do we need to provide the ability to unhook any of those components? Do we need to provide the ability to unhook any of these components? Changing that to add_action( 'wp_loaded', 'amp_admin_bootstrap' ); and then letting amp_admin_bootstrap() manage the order and initializations results in less callbacks having to be processed, i.e. only 1 instead of 5. It'll be slightly faster. Good questions. I think it'd be best to avoid renaming the functions above, as a user could have unhooked them. But it's not a strongly-held belief, and there probably aren't many users who would have unhooked them. 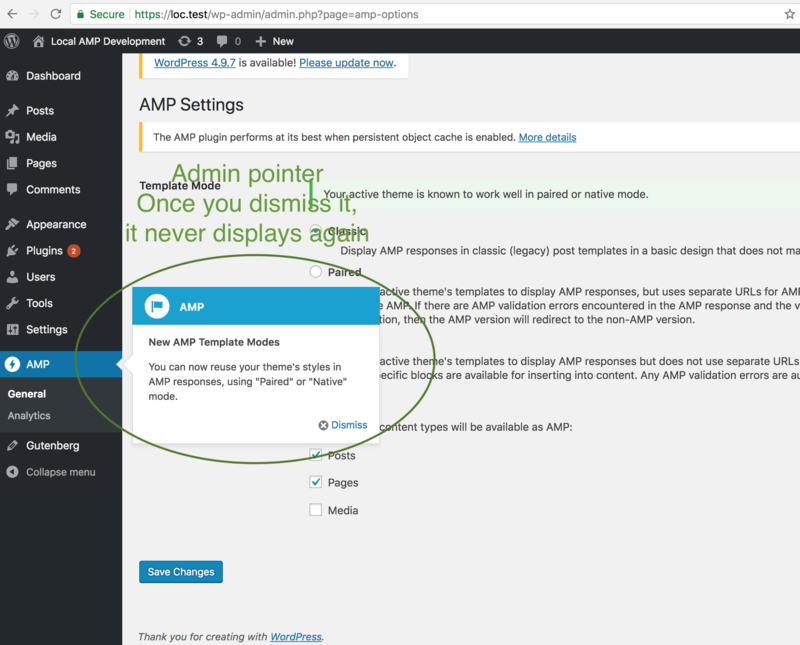 Another option is renaming amp_admin_pointer() to amp_admin_bootstrap(), without making any other change. Then, any future admin classes could add their bootstrapping there. This option is future-thinking as you are planning for future bootstrapping functionality. That's good. Now, one could argue that confusion may be introduced when a dev is deciding where to bootstrap. 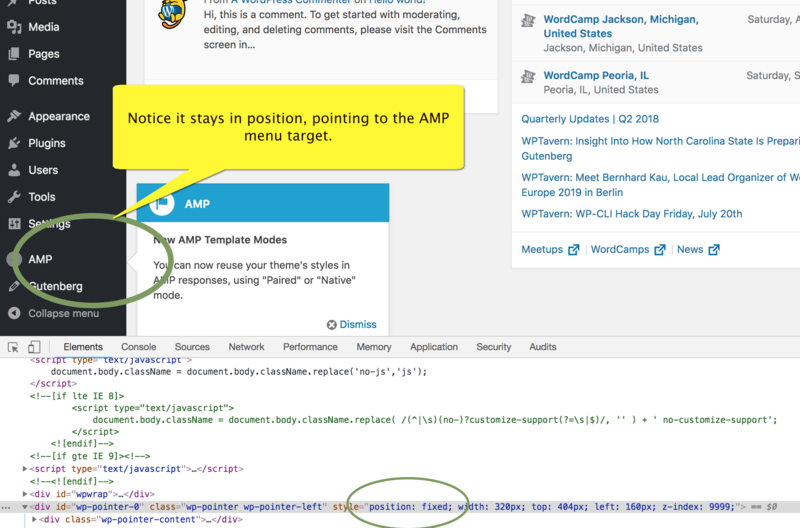 Adding an inline comment above the action hook may elevate that confusion. 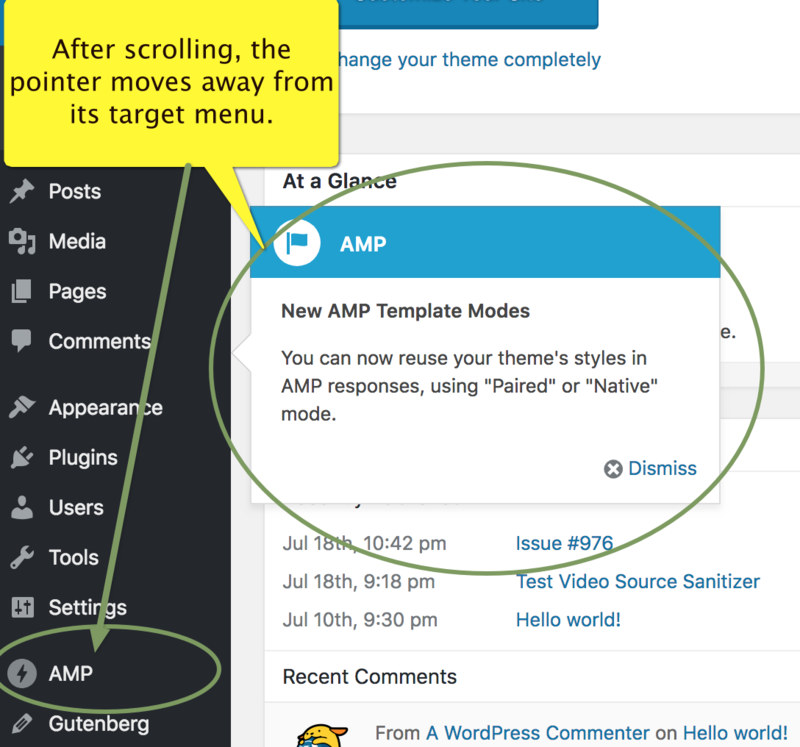 Though amp_editor_core_blocks() has never been in a released version. It was added in version 1.0. Maybe I could only combine amp_editor_core_blocks() and amp_admin_pointer() into amp_admin_bootstrap(). I'd vote to review how we want to bootstrap and consider what callbacks we can consolidate. That said, I think it's outside the scope of this particular PR. We may want to open a ticket for it and begin the discussion process beyond ours here. Yes, I think we should try to get away from bootstrapping like this because the class instantiation variable that gets created is not accessible anywhere. We should instead of an AMP plugin manager that is responsible for instantiating classes and then keeping around the references to the class instances for the plugin (and others) to access later. I think 'edge' => 'left' is probably correct, but the 'align' value might need improvement. @kienstra I think both left and middle works well. @kienstra Right now, the pointer scrolls instead of sticking in a fixed position with the AMP menu. Thanks, Tonya! That's a great suggestion to use show. Commit e84e22 does that. When no pointers have been dismissed, an empty is returned from get_user_meta. In that case, there's no need to run the rest of the code , i.e. strval(), explode(), and in_array(). We can then optimize this code by separating it out. But I think it only optimizes this if $dismissed is empty...if the user has never dismissed a pointer before. Once the user dismisses this pointer, $dismissed should at least have the string of this pointer. Unless there was an issue in the POST request in the JS file. Correct. If the user has never dismissed a pointer, then the user meta does not exist or is empty. In that case, it optimizes the code by bailing out and not running strval(), explode(), or in_array(). I also find it expresses the intent more clearly to help us more quickly read and understand what's going on. Thanks, commit e60f0 adds is_pointer_dismissed(). // Exit if the pointer has been dismissed. These changes make it a little bit easier to read and quickly know what's going on in the guard clause. Thanks, this is applied in commit e60f0. Apply Tonya's suggestion for pointer styling. Fix issue where pointer didn't appear alongside the AMP menu item. Uses the show function, as Tonya suggested. Thanks for your great suggestions here. Using show was a great idea. There are still a few open discussions here. I'm happy to add has_pointer_been_dismissed() if you'd like. I'm happy to add has_pointer_been_dismissed() if you'd like. @kienstra your code works well. Great job! It clear communicates intent of what that code is doing. It's more performant when the user has not dismissed pointers. It's more readable and quickly understandable. I suggest naming the method name is_pointer_dismissed() instead of the passive name I originally suggested. I'll leave it up to you whether you wish to change it or not. I'm approving the PR as your code does work. Abstract logic from enqueue_pointer() into this. First check that the user meta is not empty. Then, return whether it is in the array. Thanks for reviewing this, and adding so much thought into your comments.